They came with GREEN cupcake holders :) The Halloween ones have purple ones, I cant wait! Mmmmm, they look yummy already! It was in an actual circus tent! It was a black tie event but as it was FREEZING outside, I chose my warm velvet dress. Finally, here are some pics of our wonderful Christmas :) Definitely the best one in recent years :) We had a gorgeous tree, remember our tree? I made some more crackers in which I had actually hidden presents also. I know this is more of a Halloween dessert to make, but with all that pumpkin still in my freezer from the Halloween Party, I really wanted to make this for Christmas. It turned out great! Doesnt that just look divine? *grin* I thought you might like it ;) It actually looks like the picture hahaha... Now I dont know where the recipe came from, it was copied and printed long ago and added to my binder cookbook so I cant give you the source, but here is the recipe. Oh yes, the recipes is of course American so all the units are in US standard. My oven pretty much has one temperature only so that part doesnt really bother me. Hope it's ok for you though! I had the most wonderful Christmas ever! But before posting about that, I thought I would post a few recipes. This one might be a few days late, but it can really be made at any time of the year. I make this every year (some years work better than others, for example I used the wrong baking tray this year, woops!). It is very easy to follow and as long as you can split eggs you're good to go! 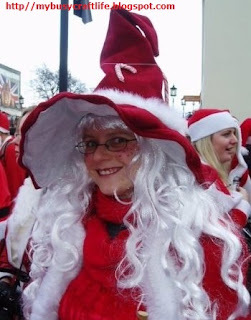 Season's Greetings from Witchy Santa! Made My Own Christmas Crackers!